Most folks don’t get it. Standing in a river thrashing a long pole with bugs on the end. It seems like a lot of work for little return, since many trout are small. It is easier and cheaper to buy trout in the grocery store. They have a point, if that’s how they see trout fishing. But simply ask a trout fisherman why they fish, and the answers might change that perception. The answers will vary: a few fish for food, some for the thrill of connecting with a beautiful wild animal, some for the challenge of mastering techniques for fishing, some for the beauty of getting outdoors, some for exercise, some for fellowship with friends and loved ones, and some for several of those reasons. But the common denominator of all serious trout fishermen and women is they are passionate about trout, a magnificent fish that lives in cold, clean water in beautiful places. Those who think trout fishing is beyond their means or ability to learn should know that is not the case. There are many ways to fish, from a cane pole with a worm to sophisticated and modern ultra-light fly or spinning gear. If you know the right places to fish, expensive gear is not required; and the Appalachians have many good places for trout. Even fly fishing, which is arguably the most technical of trout fishing methods, can be mastered easily, as explained below. So much has been written about trout and trout fishing, so many paintings done, so many pictures taken, and so many stories told, that it is impossible to see, read, and hear them all in a lifetime. Why would trout be the subject of so much attention by scientists, outdoorsmen, artists and authors? In order to find out one needs to experience a trout in its environment. Take a hike or a drive to a mountain stream with a fly fisherman. Observe the surroundings where wild trout are found. Watch the artistry with which the fisherman plies techniques to place the fly in a location on the water where the trout may mistake it for natural food. Watch how the stream carries the fly in the current, like a bug trapped on or under the surface. 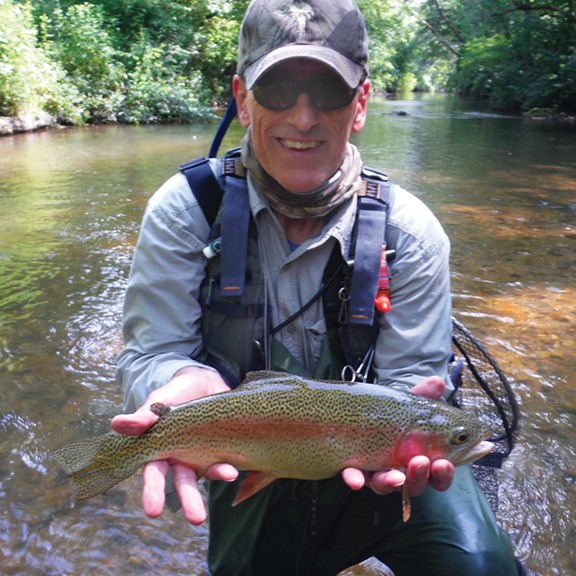 The stream’s natural flow brings the fly over the trout, and the fish rises to take the lure. The fisherman, ever vigilant, tightens the line and sets the tiny hook. The trout scurries away, only to be stopped by the taut line. Next the trout leaps from water and somersaults back in the stream for another effort to flee. After another jump or two or a run downstream, the fisherman is able to bring the fish to a soft rubber net before carefully unhooking the fish. Notice the joy of the fisherman and the care taken with the fish out of love and respect. Observe the trout in the net. Whether rainbow, brown or brook trout, each species has its own beautiful markings. The eyes are big and vibrant. Wild trout frequently have bright colors, especially before and during spawning season. There is no doubt why this fish is loved by those who seek to make connections like this. With catch and release it is best to keep the fish in or close to the water when observing or photographing it, and then carefully release the fish back into the wild to live and multiply. Quality trout fishing in America is only available in the west and Alaska. WRONG. Brook trout are native to the east coast, including the southern Appalachians, and they have been a magnificent fishing quarry since men have lived here. Brown and rainbow trout were introduced to the U.S. in the last century, and, while technically exotic species, they thrive in the Appalachians and offer quality fishing. Fannin County, Georgia, is the state’s official Trout Capital because it has hundreds of miles of diverse trout streams and is surrounded within a 90 minute drive in all directions with first class trout waters. Also, the Trout Capital and surrounding areas exclusively offer quality year-round trout fishing with no crowds and a climate suitable for comfortable winter fishing. Trout fishing is difficult to learn. WRONG. With a little instruction and information, fundamental trout fishing can be mastered. And trout fishing has several layers of skill to master and many aspects and refinements to learn, so it never becomes boring. Once you catch a trout, you want to learn to catch bigger trout. You may learn fly tying and catch a trout on your own fly that you tied. One of our Project Healing Waters wounded veterans learned fly fishing for trout at our Trout Unlimited retreat a few years ago. Within a year he was tying his own flies and he made trout rods for himself and his wife. He was smitten… in a very good way, and he has a lifetime hobby. WRONG. It can be expensive if you overdo it. But a complete beginner fly fishing outfit that includes everything you need to fish can be purchased for less than $100. A spinning outfit and lures can be purchased for even less. Starter gear can catch just as big a trout as the high-end stuff. But, if you become hooked, then there is so much great gear to buy (or make), you will be dazzled. Trout fishing is a solo sport. WRONG. The fellowship is great. Trout fishing for couples, friends, and family is terrific quality time. I learned trout fishing some 25 years ago along with my two teenaged sons, who travelled with me to Alaska and Montana. Now I am in my late sixties, trout fishing is something we still do together, and next week I am spending a week at Georgia Trout Unlimited Trout Camp with my 12 year-old granddaughter. The cycle repeats. Also, trout fishing is compatible with hiking, kayaking, canoeing, photography, and camping, so a significant other who does not fish can still enjoy the experience with you. If conservation is your passion, trout fishing is ideal. Trout Unlimited (TU), a conservation organization, provides education, fellowship, and volunteer opportunities for conservation projects and teaching kids and wounded vets (ProjectHealingWaters.org). TU volunteers build structures on streams, test water quality, and help landowners maximize their trout habitat. A TU chapter is a terrific place to make a few dozen quality friends. If you are still skeptical about whether trout fishing is for you, just give it a try. Take a guided trip or visit a Trout Unlimited meeting. I have to warn you, trout fishing is so much fun that it is addictive. Today I stepped in a stream on the guise of showing the ropes to two folks who were renting the cabin next to me, and I found myself easing downstream toward fish rising in the river below me. Who was I fooling? Ralph Artigliere is a legal writer and author who is hopelessly addicted to fly fishing. 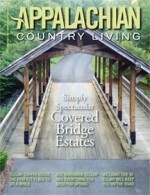 He is a member of Blue Ridge Mountain Trout Unlimited and Advocacy Chair for Georgia State Council of Trout Unlimited.